This Friday, Suzy Q visited Mother Goose School for her annual magic show! 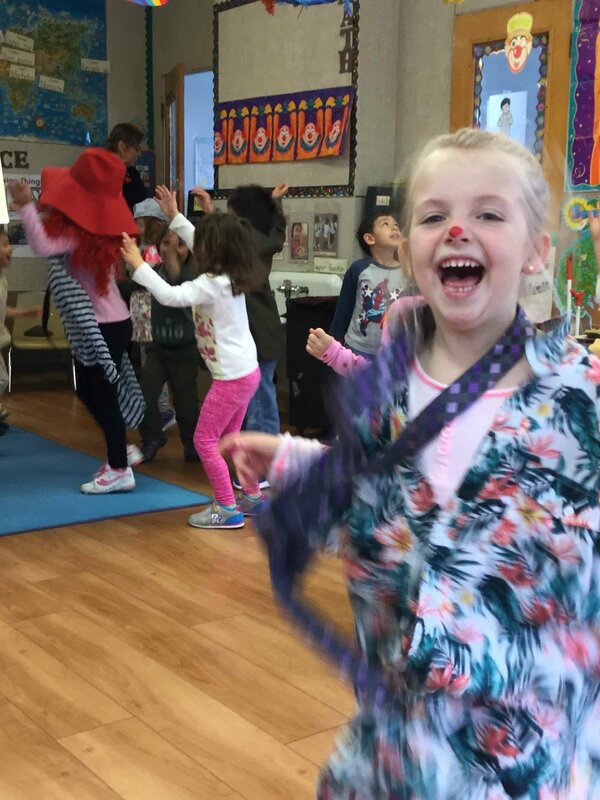 The children dressed in their silliest outfits and brought their biggest smiles to the performance. 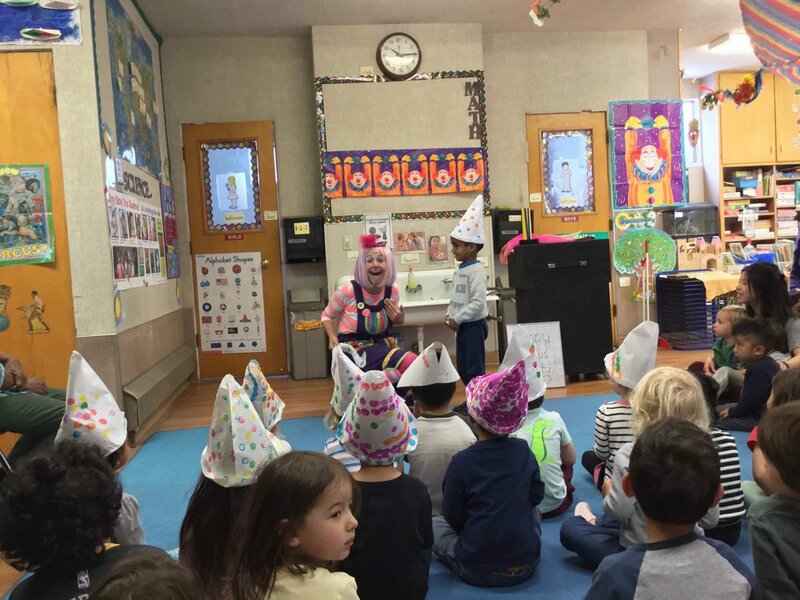 They giggled the entire time and the older children even got to attend a special Clown School. We love Circus Month! Welcome one and all to St. Pepper's Lonely Hearts Club Band (aka D-Level)! Ms.Diana's class has been working hard for the past couple weeks, rehearsing some of the most beloved songs from the Beatles. They got their instruments together, dressed in their best retro attire and put on aperformance that would make John, Paul, George and Ringo proud! Thanks to all the families for attending our annual Multicultural Show last week! It was a great turn out and the children put on a wonderful show. Please enjoy a clip of E-Level singing "Kookaburra" below; an Australian song about the native bird. B-West loves snack time and an opportunity to learn about different cultures. On Cinco de Mayo, they talked about what types of food people eat in Mexican culture. Then they celebrated with some yummy tortillas for snack time. Download School Picture Day PDF. Mr.Phill came in to teach C-level about the wonderful world of birds! They learned about different types of birds and how they camouflage themselves in their environment. They also discovered what kinds of food each one eats. 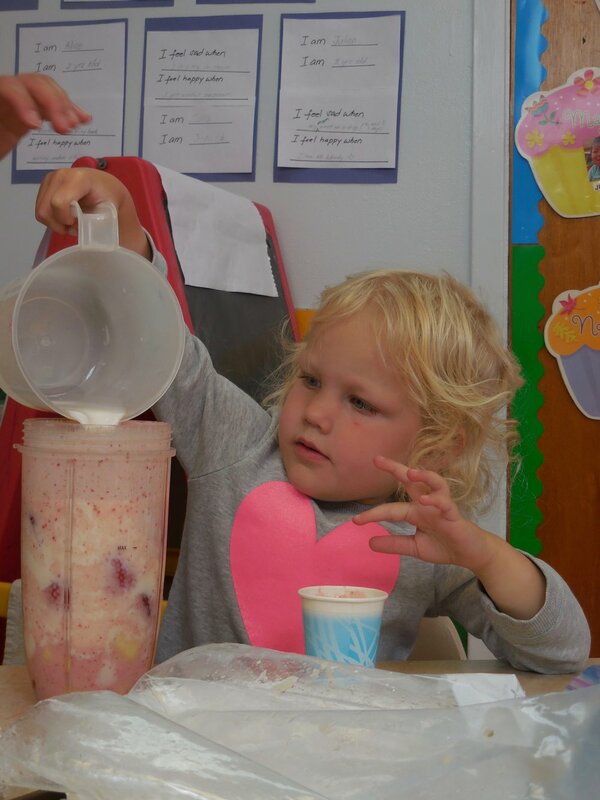 We love to learn new things here at Mother Goose! Mother Goose students sure know how to take advantage of San Francisco's few warm days. B-Levels had a blast running through sprinklers to cool off during outside play time. The letter of the week is E! To learn more about this exciting letter, A-Level made a casserole of eggs and eggplant. They helped to crack and whisk together the eggs. Then they enjoyed their creation of their E-letter foods for lunchtime! D-Level put on another fantastically entertaining show for our children today. This show's theme was Follies. They performed and sang several different Follies, including classics such as "Jack Jump Over the Candlestick" and "London Bridge is Falling Down". Check out the video below to see the funny follies unfold for yourself. 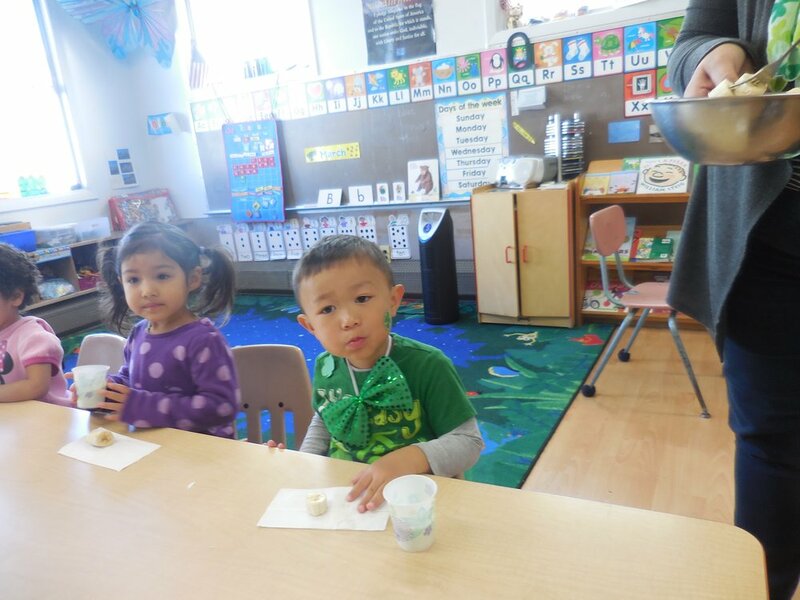 Mother Goose students celebrated St. Patrick's Day in style this Friday. 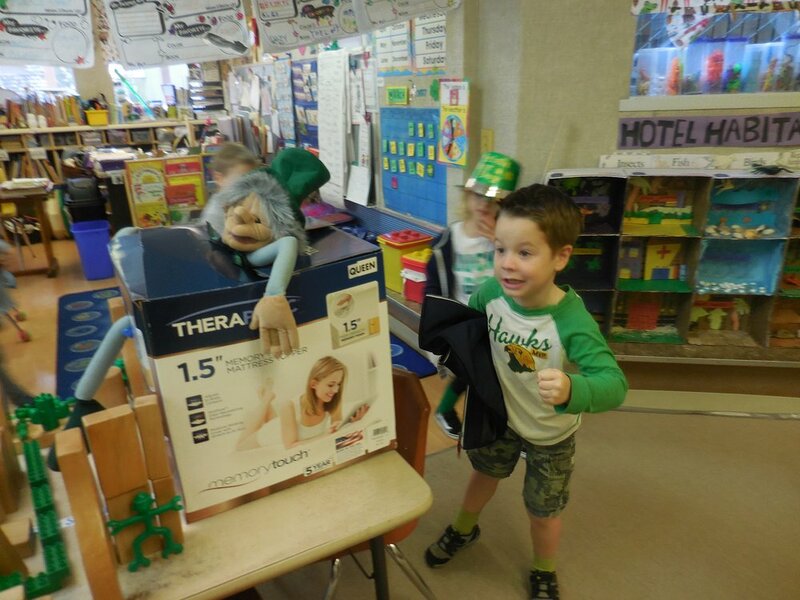 They came dressed in lucky green, drank green milk and even caught a leprechaun in D-Level's elaborate trap! February's theme was Animals and Habitats. The students participated in many fun and educational projects including a visit from the ZooMobile earlier this month! A couple classes also participated in a Habitat Challenge, using extra materials found at MGS to create an interactive habitat. Please check out C-Level's creation below, a river habitat with so many opportunities to learn from! This is a love story about appreciating differences as well as how we are alike between owls and bats, both winged creatures of the night. 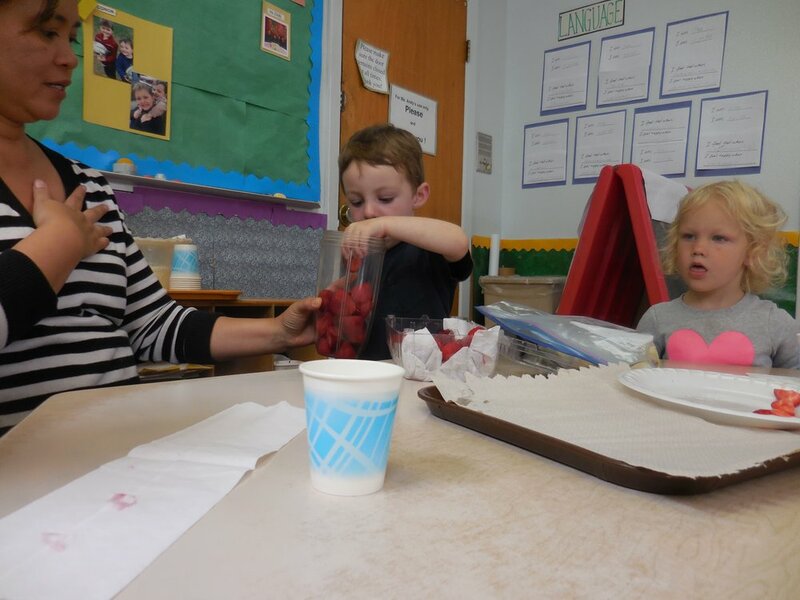 This Friday, Mother Goose students had the chance to create their own tasty (and crawly) snacks! They used fruits to create caterpillars, snails, butterflies, and spiders. They had a great time making their snacks look fun. And an even better time eating them after! We are writing to notify you that after 25 years working as a teacher at Mother Goose School, Ms. Kit has officially informed us of her plans to retire. We are sad to see Ms. Kit leave our Program. As many of you know, Ms. Kit has worked in all of our classrooms at Mother Goose School and has been an important member of our team throughout the years. She will be missed by all. Ms. Kit is a thoughtful, caring educator who has supported her constituents, nurtured hundreds of students and offered sound advice to parents throughout her teaching career. Ms. Kit’s last day working will be January 31, 2017. Our students and staff will miss her positive energy and cooperative contributions to our program. Our goal is to make Ms. Kit a scrapbook with photos and messages from the School community. The students will be working on this in class. Please let us know if you would like to contribute to this effort. We all warmly wish Ms. Kit good fortune and much happiness in her retirement. The Mother Goose Staff has worked hard to create a vision for the school and all those who attend. Please check it out on our new Vision page. Here at Mother Goose School we value our community of learners. We believe in fostering positive social emotional learning to build a positive school climate that will allow for our children to grow academically. We are a resourceful, flexible community of learners and partners for the benefit of the family and school community in a nurturing partnership. We help each other learn about our students. This enables us to become more proficient in fostering growth and independent thought and action in our children. 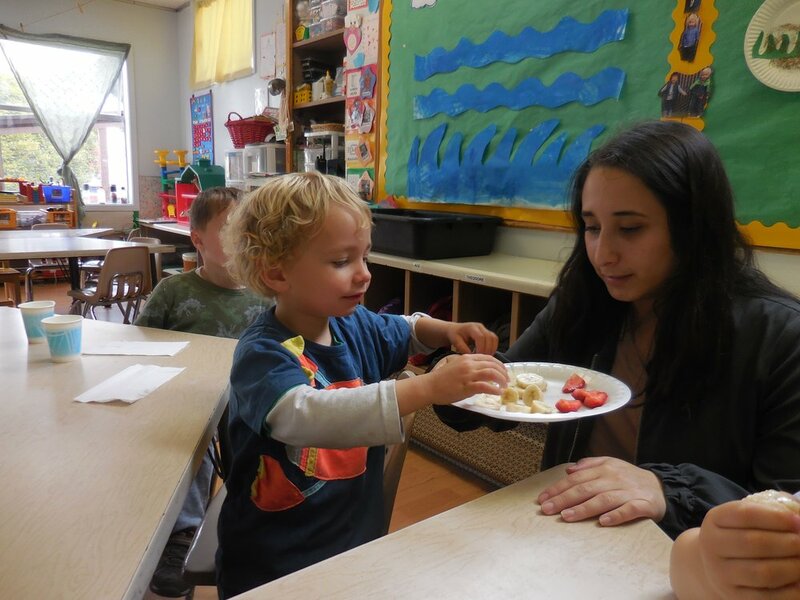 We believe in helping children to build positive relationships through social-emotional & self-regulation skills. We empower children to explore their interests and support safe risk taking to strengthen confidence and competence. We support children in their development of internal motivation and independent problem solving. 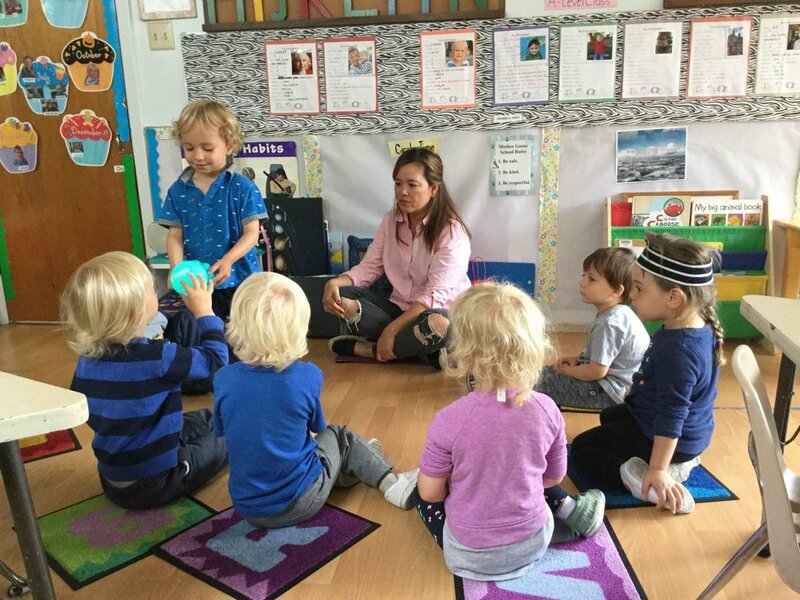 Our semi-structured, inclusive preschool environment is based on trusting and respectful relationships among students and adults. We want to provide an environment to match your child’s developmental abilities by providing realistic expectations with appropriate challenges. We value consistency between home and School environments for the benefit of each child. Above all, our goal for School is to have fun! Our curriculum features a variety of essential skill building activitiesthat develop a foundation supporting success for children in public and private elementary schools. This includes literacy, social studies, math, science, (garden, cooking, health & nutrition) the arts (music, movement, dance, drama, listening and speaking skills) and dramatic, sensory and creative play.